In the US she is already a cover girl, gracing the front of glossy magazines like Vogue and Hello. In the UK on her first visit as First Lady, Michelle Obama seems to be making just as big an impact. She has attracted as much interest and column inches as her husband on this London trip; creating a buzz with her dazzling outfits, her own schedule of events and her own fanbase. Outside Buckingham Palace, as crowds gathered in anticipation of the Obamas' arrival, Mrs Obama's star appeal was apparent. Rebecca Smith, from Leicester, was one of the hundreds of people waiting to catch a glimpse of the First Couple. "She seems to be a good role model. A strong, intelligent woman. I think she'll go down very well here. People have warmed to the Obamas. I don't think you'd see this crowd for many other dignitaries," she said. "Michelle Obama has a strong aura about her, a bit like Jacqueline Kennedy-Onassis," she added. "I do not think it altogether inappropriate to introduce myself... I am the man who accompanied Jacqueline Kennedy to Paris, and I have enjoyed it," he said. While Michelle Obama has not quite stolen the show from her husband on this trip, she has been more of a co-star than merely the supporting act. While President Obama is scrutinised for the decisions he makes alongside other world leaders at the G20 summit, Mrs Obama is being scrutinised for her fashion choices. And on this trip there have been many. By Wednesday evening she had sported four different outfits, from a bright yellow dress designed by Jason Wu (the man behind her inaugural ball gown), to a sparkly cardigan and skirt set by US high street store J Crew (another of her favourites). The fashion press have so far given her outfits the thumbs up. Marc Karimzadeh, from the Women's Wear Daily fashion website, said of her yellow dress: "I think it was an optimistic colour... the hopeful, optimistic colour really signifies what a lot of people hope this trip will be." When she met the Queen at Buckingham Palace, Michelle Obama opted for a more formal outfit: a black jacket with a white top. Later in the evening, however, at a Downing Street dinner, she lost the outerwear to reveal her bare arms in an ivory top. Fashion aside, Michelle Obama had a busy schedule of her own. As her husband spent Wednesday morning facing questions from the media alongside Prime Minister Gordon Brown, Michelle Obama accompanied the PM's wife Sarah Brown on a visit to Maggie's Cancer Centre in West London. Meeting patients and staff, the First Lady reminded people that she has an interest in supporting charitable causes. Mrs Obama was friendly and at ease as she introduced herself personally to everyone as "Michelle" and even sat down to have a traditional cup of British tea, something she admitted she did not drink too often. "The warmth and patience she showed and the time she took to engage with everyone was greatly appreciated," said Laura Lee, chief executive of Maggie's Cancer Centre. Trudi Cogdell, a patient at the centre, described her meeting with the First Lady as "very friendly". "She's a lovely lady, she's very open... she'd talk to anyone". Michelle Obama has frequently displayed a down-to-earth approach during the trip. On meeting the Queen, she followed formality by curtseying, but later, during a reception, she showed her more casual, affectionate side by putting her arm around Her Majesty to hug her. 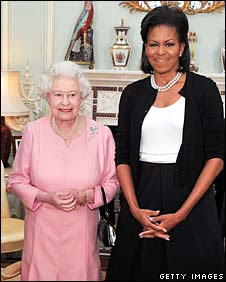 It is reported that the Queen was so taken by Mrs Obama she even said: "Now we've met, will you please keep in touch?" Outside the palace, Kevin Egglestone, an American who is studying in London, said Mrs Obama had a unique appeal. "I think it's hard for people to dislike her once they see her. She's always smiling, has a little bit of glamour and a knowing wink". And Mr Egglestone added that he thought the positive image Michelle Obama was portraying here in London could help America's standing around the world. "Seeing a First Lady that represents a part of America that is engaging and not aloof who you feel you can approach, will also give people the feeling that they can engage with America."